The Lion Attacking a Horse is an emblem of triumph and defeat. 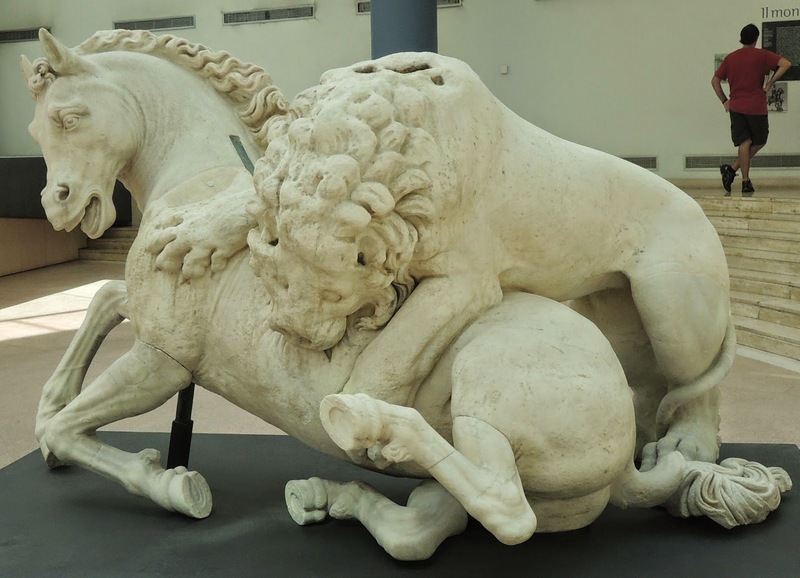 Representing a terrified stallion mauled by a savage beast, the marble sculpture is dated to the early Hellenistic period (late fourth century B.C. ), when Greek sculptors began to produce naturalistic portrayals of intense emotion and physical exertion. The sculpture probably came to Rome as a trophy from the wars with ancient Greece and it was originally in the Circus Maximus until the stadium was abandoned about 550 AD. There is documentation that by 1300 The Lion Attaching a Horse came to be on the staircase of the Palazzo Senatorio on the Capitoline Hill as a symbol for the city of Rome and a link to the city's glorious past. After the bronze she-wolf replaced The Lion Attacking a Horse as the icon of Rome it has been on display in various locations on the Capitoline Hill. Today it is exhibited adjacent to the original Marcus Aurelio statue in the Capitoline Museums. Fantastic image, Larry. I'm learning so much from this year's calendar. Thanks!